Not too long after Istanbul, it was already time to travel again, this time to the attractive university city Cluj-Napoca, Roman Claudiupolis, in Romania. 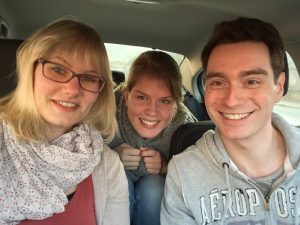 Together with two of the Groningen MA students in the Classical, Medieval and Renaissance Studies program, I participated in a week-long EpiDoc course. 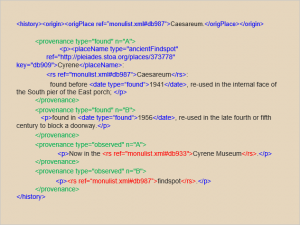 EpiDoc is an XML-based way of encoding or ‘tagging’ inscriptions, that makes them highly accessible for digital research. 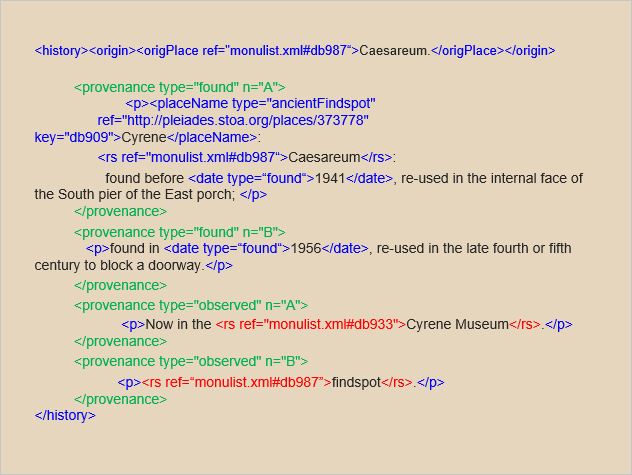 Whenever we publish inscriptions online, we should do so in this standardized format, encoding specific information on for instance dating and locations. This allows the computer to extract this information for you on large corpora of sources. Other possibilities include tagging e.g. personal names, geographical names, even structural elements of the text (preambles, publication clauses) – or anything you’d like, really – within the texts themselves. Doing so systematically and comprehensively would eventually lead to a treasure trove of quantitative data and a plethora of research opportunities. My fellow Groningen grad students Sam and Caroline, who assist prof. Onno van Nijf on the Ancient Athletes Online database, introducing their work to the group. 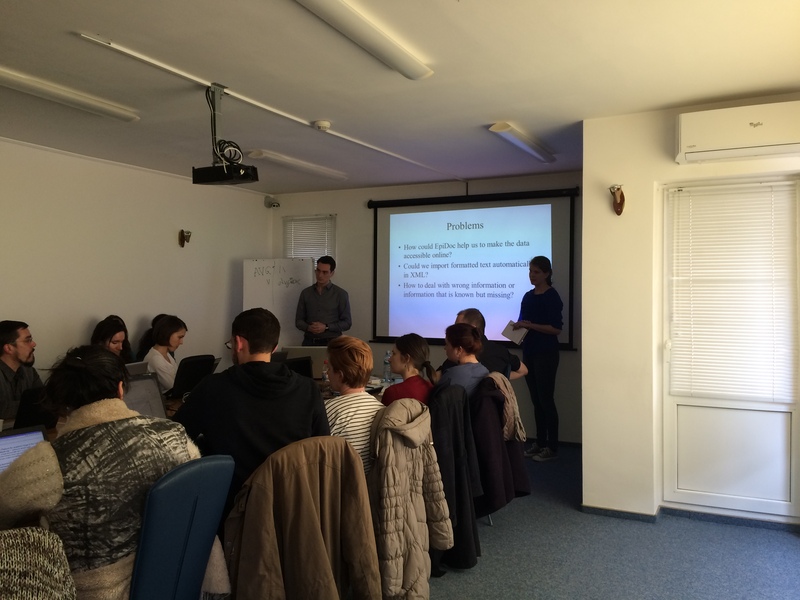 During our stay in Claudiupolis, we immersed ourselves in the ins and outs of the EpiDoc system under the inspiring tutelage of Gabriel Bodard (ICS), in the interesting (though somewhat absurd) environment of the sports campus of Babeș-Bolyai University. Although none of us can say that we mastered the system, it was inspiring to acquaint ourselves with the possibilities, and the research opportunities that tagging inscriptions presents us with. Bodard furthermore introduced several other tools from the field of digital classics, which will certainly come to use. Participants were given the opportunity to give a brief presentation on our research during the course, which I gladly accepted. It was a treat to catch a glimpse of the wide range of research done in the field of epigraphy, from Boeotian-Attican relations in the Classical era (by our fellow Dutchman Roy van Wijk, conducting his PhD at the University of Fribourg), to newly discovered Sanskrit texts that can hardly be deciphered yet. As an added bonus, I was given a useful pointer in the direction of honorific decrees for Koan doctors, which seem to behave rather similarly to decrees for foreign judges. This is certainly worthy of some exploration. We finished the course with a sense of the near-endless opportunities posed by digitizing inscriptions, but also realizing that there is a LOT of work involved. For my own research, I do not see an immediate application: I do not intend to re-publish material online, and it would be too time-consuming to (manually!) encode all my material. We had a really fun week, also getting acquainted with the other participants, and getting to know the city of Cluj a bit. Entertainment included a great Soviet-themed cocktail bar, not one but two trips to the local escape room operator, and an exciting road trip to the ‘Bear Cave’, Pestera Ursilor, an impressive stalactite cave some hours’ drive from Cluj.